First of all, today is Election Day! GO VOTE! .....And to smoothly segue into fitting election news for a cat blog, we just found out that Socks The Cat (formerly First Cat during Bill Clinton's terms in office) has starred in a 90's video game! It will potentially be released to the public pending their Kickstarter campaign success which appropriately, ends tonight. Some backstory: The video game was never released in the 90's but now currently has a Kickstarter campaign hoping to raise enough money for an actual production run. As of right now, they are only $321 away from meeting their goal of $30,000 - the Kickstarter deadline is tonight so hurry up and pledge if you want to be a part of this magical video game! The premise was wacky yet simple. You play as Socks the Cat, or Socks as we affectionately call him. The ultimate pet of the 90's. The White House cat. 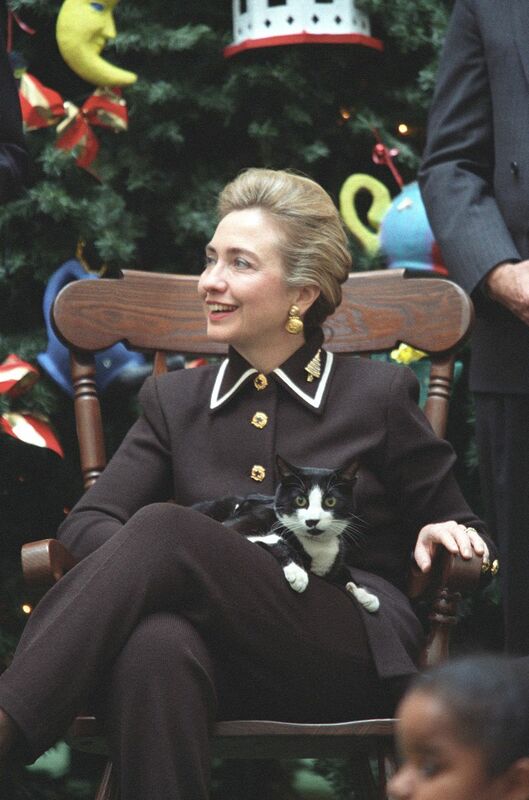 The "First Pet" of the Clinton administration. Your mission? To fight your way through the White House battling all sorts of enemies, including spies, Dobermans, protestors and satirical versions of famous political figures as end bosses. The game was set to be released on the ever popular, Super Nintendo Entertainment System or SNES in the early 90's. You don't need to have any particular political leanings to support this video game, but I bet Socks would be super proud of his mama.